Mutant mer-cow monstrosity terrorizes Williamsburg and points east, but makes a very good burger. The local people still speak of the evil mer-cow that once rampaged through Grand Street. Make no mistake, Williamsburg's relative-newcomer Walter Foods is a very, very welcome addition to Grand Street, where another seemingly anonymous eatery seems to pop up weekly. 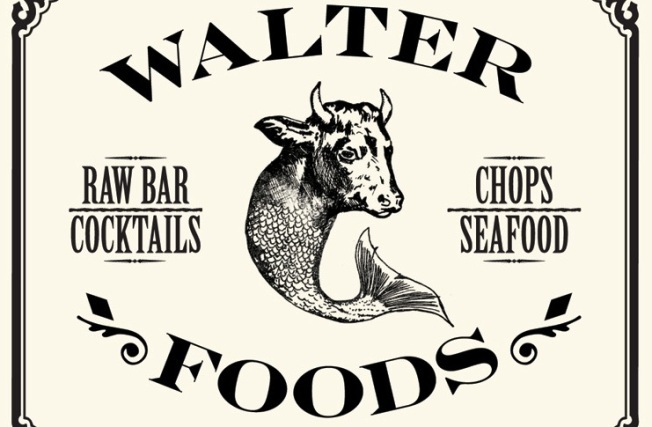 If you couldn't guess by the frightening mer-cow logo (which causes passersby to exclaim "dear god" before they are enchanted by the smell of grilling meat), the place is a chophouse-seafood mashup. But where some combinations that seem to make sense at first blush don't pan out in the end (Public Enemy and The Jon Spencer Blues Explosion) and others succeed (chocolate and peanut-butter), Walter Foods ends up in the latter camp. The raw bar easily takes the local title (but then what was it up against? Food Swing's 'prairie oysters'? ), offering all the classics — stone crabs, various oysters and the like — giving a brief intermezzo between strong cocktails and the meat of the matter. And yes, this is yet another dip into classic cocktail culture. From Gold Rush to Gimlet to Green Fairy, the gang's all here. But too many well-made, balanced, and nicely presented cocktails should never be a problem. One of the owners, Danny Minch, is a former Balthazar bartender, and he's brought that bistro flair (bow-tied waiters and bartenders, simple dark interior) and precision to the preparations here. The burger is a thing of beauty. The smokey ground short-rib offering could hold its own any of the much ballyhooed recent burger war entries, and makes the local legend DuMont burger feel superfluous. We didn't know mer-cows even had ribs. All this being said: the logo still haunts the dreams of children who glimpse it — even if just for a second.